Four weeks ago, Derrick Rose scored an electrifying 50 points against the Utah Jazz and the Minnesota Timberwolves were a .500 team. Then came a winless West Coast trip and Jimmy Butler’s exit to the Philadelphia 76ers. Since Butler was traded, the Timberwolves are slowly climbing toward .500 and their first opportunity at reaching the break-even point is Wednesday at home against the San Antonio Spurs. The Timberwolves (10-11) are 6-2 in their last eight games since Butler was traded for Robert Covington and Dario Saric. While they are averaging 106.5 points, they are getting it done defensively of late by holding opponents to 100.6 points. Their defensive numbers have improved during a three-game winning streak. 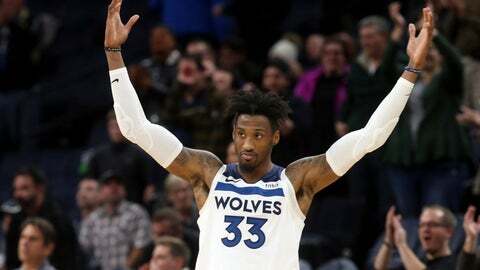 After getting double-digit wins over Brooklyn and Chicago on a back-to-back Friday and Saturday, the Timberwolves picked up a 102-95 win on Monday in Cleveland. Covington scored 24 points after going 1 of 18 Saturday and drew a key offensive foul on Cleveland rookie point guard Collin Sexton down the stretch. Karl-Anthony Towns added 21, and Rose scored 10 of his 12 points in the fourth quarter. The difficulties the Timberwolves encountered in winning while Butler’s trade request seemed to distract things and potentially send a season spiraling out of control, but now they are on a strong turnaround, especially defensively. Especially since Wednesday, the Timberwolves face a team they rarely beat. The Spurs are 14-1 in their last 15 meetings with the Timberwolves and opened the season with a 112-108 home win over Minnesota on Oct. 17 when DeMar DeRozan scored 28 points and hit the tiebreaking basket with 32.4 seconds left. The latest win over Minnesota was part of San Antonio’s 6-2 start, but the Spurs are 4-8 in their last 12 games and are at .500 for the third time at 10-10. It’s the first time the Spurs are .500 through 20 games since the 2003-04 season when they won 57 games. During the last 12 games, the Spurs are scoring 106.8 points and allowing 109.6 points. They have allowed more than 100 points in five straight games, including 140 at New Orleans on Nov. 19 and 135 at Milwaukee on Saturday. San Antonio is trying to get consecutive victories for the first time since winning four straight from Oct. 27 to Nov. 3 after holding on for a 108-107 win over the Chicago Bulls on Monday in a win that was decided when Ryan Arcidiacano missed a 3-pointer at the buzzer. The Spurs picked up the win by riding the tandem of LaMarcus Aldridge and DeMar DeRozan down the stretch. Aldridge scored 11 of his 20 points in the fourth quarter and DeRozan paced the Spurs with 21 points to go along with a reserve unit that finished with 44 points. Aldridge reached 20 points for the ninth time and the Spurs remained unbeaten when he does so after he scored on numerous post moves down the stretch. During San Antonio’s last 12 games, Aldridge is averaging 16.3 points on 41.3 percent shooting. Monday was his fourth 20-point game in that span. “L.A. got very aggressive down the stretch, and that was the difference in the ballgame,” Spurs coach Gregg Popovich said of Aldridge, who also is shooting 57.1 percent (28 of 49) in his last three games since a 6-of-20 showing in last Wednesday’s loss to the Memphis Grizzlies. Aldridge scored 21 points in the first meeting with Minnesota. He is averaging 19.3 points in 44 career games against the Wolves.